Read ancient science books on-line in their original form. Recently I introduced the Royal Society of London’s 350 anniversary Trailblazing website portraying historic work and providing links to the originals from the pages of the Philosophical Transactions. If you haven’t seen this already, check it out. I’ve just learnt of more ancient science available, this time from the American National Library of Medicine who provide interactive access to several books through their Turn the Page website, including Robert Hooke’s Micrographia and Vesalius’s De Humani Corporis Fabrica (On the Fabric of the Human Body). There’s great illustrations, interesting titbits and the ’look and feel’ of the manuscripts to enjoy. To ’open’ a book, click on the ’Turn the Pages’ link below the introduction to the book. A animation (Flash) will load, which might take a few seconds if you have a modest broadband connection. Click on a page (or cover) to turn over the page. The T (Text) icon on the left will display some background information about the current page open. If you prefer to have this text read out aloud, click on the speaker icon to the right. 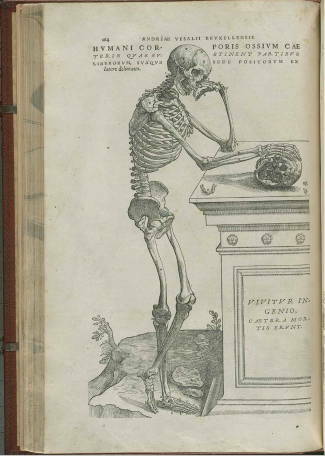 On some of the images, rolling the mouse over the image will give you more information about that portion of the image (try the frontspeice of Vesalius’s De Humani Corporis Fabrica as an example). You’ll find the same is true of text that’s not in English. To zoom in on the page, so that you might read the text or explore the illustrations more closely, click on the magnifying glass then wait. You should get one of those rectangular magnifying screens, like those that come with large dictionaries printed in small type or with up-market atlases. You will, of course, struggle to read some of the old text, being in Old English or Latin but the information the website provides is great and the illustrations are wonderful. There are also galleries of the images, if you prefer to view the contents that way. You can view the image above, and many others, in their full-sized glory. This post was mentioned on Twitter by sciblogsnz: Explore ancient science books on-line: Read ancient science books on-line in their original form.